It is now all the rage in the Age of Al Gore and Obama, but can you remember when everyone in America was not “Going Green”? 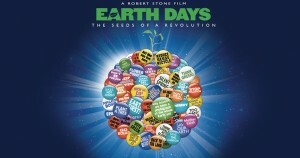 Visually stunning, vastly entertaining and awe-inspiring, Earth Days looks back to the dawn and development of the modern environmental movement—from its post-war rustlings in the 1950s and the 1962 publication of Rachel Carson’s incendiary bestseller Silent Spring, to the first wildly successful 1970 Earth Day celebration and the subsequent firestorm of political action. Earth Days’ secret weapon is a one-two punch of personal testimony and rare archival media. The extraordinary stories of the era’s pioneers—among them Former Secretary of the Interior Stewart Udall; biologist/Population Bomb author Paul Ehrlich; Whole Earth Catalog founder Stewart Brand; Apollo Nine astronaut Rusty Schweickart; and renewable energy pioneer Hunter Lovins—are beautifully illustrated with an incredible array of footage from candy-colored Eisenhower-era tableaux to classic tear-jerking 1970s anti-litterbug PSAs. Directed by acclaimed documentarian Robert Stone (Oswald’s Ghost, Guerrilla: The Taking of Patty Hearst) Earth Days is both a poetic meditation on humanity’s complex relationship with nature and an engaging history of the revolutionary achievements—and missed opportunities—of groundbreaking eco-activism.